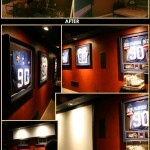 Custom Audio / Video systems should look as good as they perform! While electronics are the foundation to any Kansas City Home Entertainment system, most people don’t want these devices taking over their living space. We certainly agree, that is why CINEMA AT HOME is well known for our exclusive Kansas City Entertainment Center Cabinetry designs and Custom Enclosures. We have select craftsmen skilled at creating beautiful, furniture-grade structures that are custom-designed to accent your home’s décor while providing a discrete out-of-sight location for your A/V components. Creating recessed equipment racks, custom cabinets and decorative valances begin utilizing 3D Design software to meet your specifications. This allows us to present you with detailed images for approval prior to beginning the construction process. CINEMA AT HOME focuses our attention on every detail of your Audio/Video project; custom entertainment cabinetry is just another way we promote seamless integrated systems. We can create everything from Wall-to-Wall Entertainment Cabinets to Framed TV Enclosures that accent, or hide, your wall-mounted televisions. Entertainment Center Cabinetry and A/V Enclosures provide both media storage and a place to display, or hide, your entertainment system electronics. Our handcrafted cabinets are custom designed for your home, and your home only. We will work with you in designing your own Entertainment Center by providing many options in style, sizes and finishes. CINEMA AT HOME’s exclusive Entertainment Cabinetry provides a showcase for your A/V equipment, while our furniture-quality construction will provide a lifetime of enjoyment. We also offer many selections and styles of pre-built Entertainment Centers and Media Cabinets to choose from. One of the fastest growing trends in Kansas City Home Entertainment is the placement of a Flat Panel Television above a Hearth Room fireplace. Many installers simply mount a Flat Screen HDTV on the mantel. CINEMA AT HOME goes further by actually integrating your HDTV display into custom designed and built Hearth Mantel Frames or Extensions, carefully created to match your existing mantel piece. These Mantel Frames and Extensions actually give a new dimension of style and class to an otherwise uninteresting Flat Screen HDTV installation. From our Custom Design Software, our craftsmen create beautifully detailed enclosures that will showcase your Flat Panel HDTV. 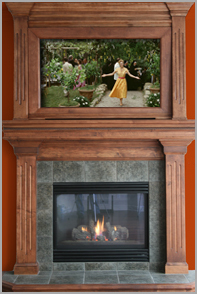 Making your Hearth Room HDTV a piece of art, as well an attractive centerpiece. This is just one example of CINEMA AT HOME’s attention to detail to your home’s décor. CINEMA AT HOME can design a custom frame for LCD televisions, Plasma televisions, LED televisions, Flat Panel televisions and frames for Projection screens and Projectors to fit any home décor and design. Providing an unobtrusive location in which to locate the numerous electronics needed for an entertainment system should not be taken lightly. These components are delicate and heat sensitive, requiring strong shelving and ventilation systems. 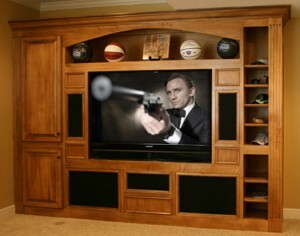 CINEMA AT HOME are experts when it comes to designing and building shelving and equipment racks for your components. Often we recess these racks and shelving into walls accessible from both behind and the front, and hidden by cabinet doors. In some cases, these racks are on rollers, allowing the components to slide out from the wall providing easy access for service and upgrades. 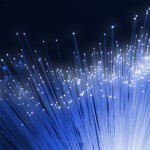 CINEMA AT HOME has many options when it comes to securing and ventilating your electronic component investment.